Laptop Thoughts: Lenovo Has a Honeycomb ThinkPad Tablet on the Way! Lenovo Has a Honeycomb ThinkPad Tablet on the Way! "...we just got a hold of a juicy PowerPoint that reveals a new ThinkPad tablet for “on-the-go professionals.” No, this isn’t a Windows 7 convertible like you’d expect — this is a full-fledged Android 3.0 slate complete with an optional pen and an accompanying “keyboard portfolio case.”"
Those of you who have read my posts know that I'm not a fan of Apple's mobile devices. One thing that I do think Apple has done right is use IPS LCD's. OLED's, I don't care what kind, just take too much juice too much of the time and while a 40,000/1 contrast ratio is all kinds of hotness I'm not convinced that 1000/1 isn't good enough for my phone. IPS LCD's are just as bright as possible without using too much power. I'm glad there is finally an Android tablet coming that will use this display technology and, unlike Apple, it will not have a screen resolution and aspect ratio from 1995;) Besides that, I'm a big ThinkPad fan. I had one for about 8-10 years, yeah it was IBM but still made by Lenovo and took a real beating. 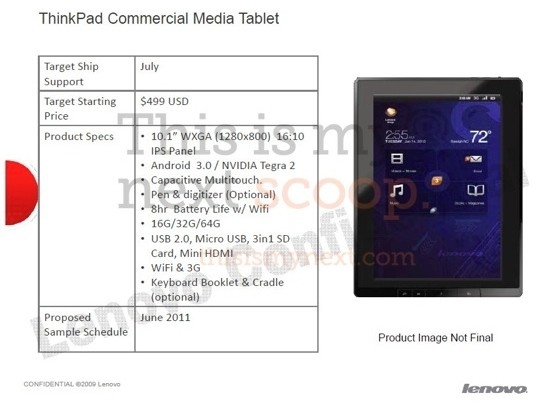 It was definitely a high quality and well built machine so I'm glad to see Lenovo releasing a Honeycomb tablet. One other thing I like about this is the full size SD port and full size USB port. A full size HDMI port on there would be great while they're at it but MicroHDMI isn't too bad since they're becoming fairly common anyway. I should make sure to mention this information is an unconfirmed leak so please check out the source for yourself from the "Read" link below. Let us know if anything about this tablet gets your attention. What do you think of the optional keyboard and pen input?